I never knew my grandfather Benjamin McEwan. He died when I was three. My mother really did not have much of a relationship with him either. He was born in Toronto, Ontario in 1879 the youngest living son of John McEwan and Janet Stevenson. He grew up as part of a large family in the eastern part of downtown Toronto. By the time Benjamin was born the family lived on Saulter Street. As was customary in those days he would live at home until he married. 038789-7053 - 29 September 1879, Benjamin McEwan, Male, son of John McEwan jeweller, and Janet Stevenson, 101 Duchess Street, Toronto, reg’d 15th October 1879 Dr. H. H. Wright, Robert Reddy. The family was not by any means wealthy, John and Janet's oldest son Robert was also contributing to the household income. While only fifteen at the time he was employed as a lithographer. The others ranged in age as follows: William thirteen, John eleven, Edith nine, Henry seven, Marion five, Jessie three, and Benjamin two. From the beginning finding Ben (in documents such as the Canadian census) always posed a problem. In the 1881 census Ben is on a separate page from his parents and his name is spelled as follows: Benjaman McEwin. Throughout the years his name always seemed to be misspelled. 01531-00 (York) Benjamin MCEWAN, 21, fur cutter, Toronto, same, s/o John MCEWAN & Janet STEVENSON, married Fanny G. OSTROM, 18, Canton Ont, Toronto,d/o Simeon C. OSTROM & Frances KNIGHT, witn: Emma OSTRAM and Harry KNIGHT both of Toronto, 10 April 1900 at Toronto, Congregational, Rev. J. P.GERRIE, licence reg. 9 May 1900. In 1900 Ben married Frances Gertrude Ostrom in Toronto. Fannie was just 18 at the time. When they first married they lived at 81 Lewis and Ben was employed at R. Reilly & Co. as a fur cutter. Ben and Fannie gave birth to her first child several months after the wedding. May Irene was born in September but only lived a few months. In the next ten years there would be five more births but only three children survived. Fannie died while in childbirth along with the last child in January of 1910. In 1910 Ben was living in a house he had built for Fannie and still working as a fur cutter. Fannie had died during childbirth along with the last child in January of 1910. 019074-11(York) Benjamin MCEWAN, widower, 30, fur cutter, Toronto, same, s/o John MCEWAN & Janet STEVENSON, married Olive May Clements, 20, , Toronto, same, d/o Henry Clements and Maria Trotter, witn: Ben Croft and Louisa Clements both of Toronto, 11 January 1911 Toronto. Ben did not waste time remarrying. He married Olive Clements, ten years his junior in January of the following year and they would also have a child that first year, sometime after April when the census was taken with four more to follow. The 1911 census has Ben and Olive living at 534 Pape Avenue, with Fannie and Edgar, two of the children from his first marriage. The youngest, Lilly, my mother was living with Ben’s parents and would remain there. Frances and Edgar left the same year to live with their grandmother in Saskatchewan. It was reported by family members that Ben’s new wife did not treat the children as they should have been treated and that they would be better off if raised by their grandmother’s. I guess Ben did not object, and so it was. Ben moved around the city somewhat and in 1921 he was living at 31 Langford Avenue with his new wife Olive, and four children; Margaret ten, Kenneth eight, Harvey six and Marie two. They would have one more child Bernice in the next few years. Check out my blog page "The Fathers That Were Not Always There"
Ben did not continue much contact with the children he had with Fannie and I do not know if he kept much in touch with his parents either. Lilly, my mother, was raised by them and said she did not have much to do with him. She remembered once as a child receiving a birthday gift of handkerchiefs and not being pleased. She did also mention that he did visit her after her marriage to Kelvin but said little more about him. Whatever happened the family did not keep in touch with Benjamin and his new family very much. My mother was aware of the step-sisters and step-brothers and I remember her speaking fondly of Ken. Benjamin McEwan died from Chronic lymphocytic leukemia in Toronto May 24th, 1953 at the age of seventy-three. He was buried at St. John's Norway Cemetery and Crematorium in Toronto. In the Toronto Daily Star, Friday October 28th 1921 and interesting article appeared in which Benjamin McEwan was mentioned. There were a group of businessmen in Toronto who had applied to trap, kill and also propagate beaver in a northern area of Ontario. The Company formed with Benjamin as the president was called the Northern Rice Lake Fur Company of Toronto. The land in question was a track of 4,160 acres these men had acquired from the James Bay Company in June of 1920, with hopes of making it profitable not only from the trapping of beaver, silver fox and skunk but also with a breeding project with regard to the beaver. One of the government departments allowed them the permit to occupy the land, but a second was only allowing them to use six acres for their breeding purposes. The land in question was northwest of Sudbury and about twenty-five miles east of the CPR between Ostrom and Woman River. I found it interesting the nearby town was named Ostrom and would be interested to know where it got its name. Ben’s first wife was Frances G. Ostrom. The article mentioned that at that time they had received a permit to use only six of the four thousand acres to install four imported foxes, ten imported mink, twenty Ontario racoon and 100 imported black skunk. The company was disappointed in the decision and could not understand that while the government was trying to encourage more game sanctuaries, they would be allowed to trap and kill ten beaver but not to keep any for breeding purposes. Their initial hopes were to have thirty male and thirty female beaver for propagation. The land in question was two thirds covered with water and the rest was populated by birch and alder trees which would have proved particularly good for raising beaver. The company had planned to fence off the beaver for protection as well as muskrats. They also had plans to scientifically raise silver fox. When the news came to the company of the refusal they were looking into establishing a fur-bearing animal ranch in Quebec where they felt they would be better received. 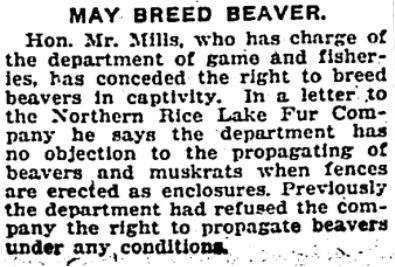 Finally, in the Toronto Daily Star on Saturday, December 3rd 1921 The Honrourable Mr. Mills, who has charge of the department of game and fisheries, conceded the right to bread beavers in captivity. In a letter to the Northern Rice Lake Fur Company he says the department has no objection to the propagating of beavers and muskrats when fences are erected as enclosures. This changes the ruling that was previously made. Over the next several years the company advertised their wares in the Toronto Newspaper. "The Fathers That Were Not Always There"
Special Note: Thanks to my cousin Marion Walter for this information about Ben's Fur Company.